This luxury beachfront home blends modern style with surf side living to create one of Huatulco's most popular vacation properties. Offering an oceanfront infinity pool and open-air living area this is the perfect home to kick back and enjoy your tropical holiday. 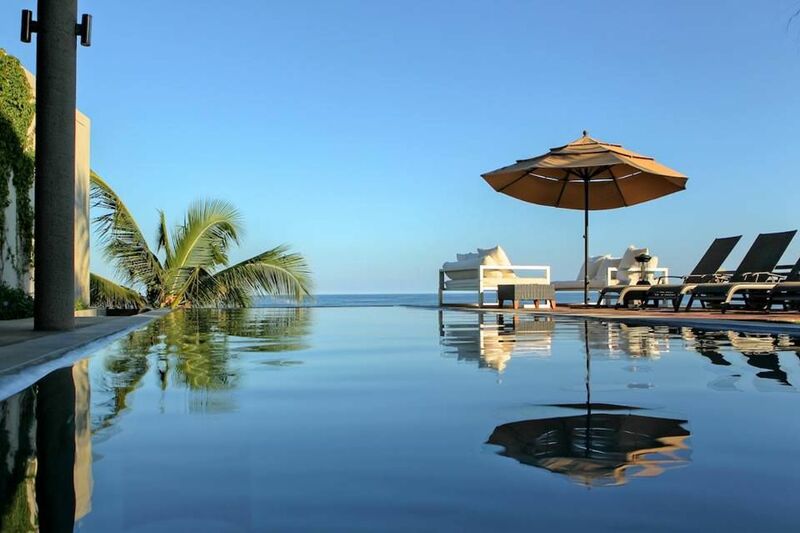 As part of the My Huatulco Vacation Luxury Collection, this beachfront property is located on La Bocana beach. This location offers access to Huatulco’s best surf breaks and is also in walking distance to the spectacular areological park. The Bocana community offers a quaint setting complete with cobblestone streets, fun local mud baths and beachside lunch spots. This property features three bedrooms and can accommodate up to eight guests. The master suite is in a category of its own with floor to ceiling windows and panoramic ocean views. The bedroom space includes a private ocean front terrace, king-sized bed, walk in closet and small office area. The full ensuite bathroom not only offers floor to ceiling windows but also an open-air shower. There are two additional guest suites both complete with full ensuite baths. The first located on the upper floor offers two queen-sized beds. The second located on the main level offers a king sized-bed with a small sitting area and office nook. The living area is an open-air concept featuring comfortable seating and a daybed. This space provides direct access to your ocean view infinity pool and outdoor seating area. Watch the waves roll in from this stunning ocean view kitchen located within this open-air living space. This gourmet kitchen features granite counter tops, stainless steel appliances and a breakfast bar with seating for four. There is also a covered dining table with seating for eight. Whether you choose to cook your meal or take advantage of our chef program, both options are readily available. Relax in your private ocean view infinity pool or, if you would prefer an ocean swim take your private stairway down to La Bocana beach. Note: Maid and laundry service is included every-other-day. Although there are many local activities only a short cab ride away, renting a car at this property is recommended. If you are thinking about a round of golf, Las Parotas Golf Club is a 15-minute drive. A 10-minute drive will take you to Tangolunda’s resort district, offering many bars and restaurants. You can find many shops that offer local artwork, clothing, coffee and Mescal as well as dozens of bars and restaurants in La Crucecita, a 25-minute drive away. This property is a 25-minute drive from the Huatulco Airport. Transfer service can be arranged through our office, inquire for details. A MESSAGE FROM THE OWNERS: We live in Southern California and have been lucky enough to always live near the beach. With an active commercial real estate company, 2 college aged children and a large dog at home our lives are very active. We have done a fair amount of traveling across the globe on family vacations, and on surf treks for my husband. Some of our best memories are with the family in foreign countries on some adventure. As Los Angeles has grown and the traffic increased we have been dreaming of a “get away from it all” with the spice of a foreign country, but with the comforts of home. We were married in Huatulco in 2000 so it holds a special place in our hearts. My husband has been a surfer since he was 12 and has spent many a day in the cold water of Southern California, so our perfect vacation home had to have warm water, with a great surf break nearby. When the opportunity presented its self to buy a 'lot on the beach, in front of a surf break in Huatulco' we jumped at the opportunity. With only two lots on the beach in all of Huatulco we feel blessed to be the proud owners of one. As my passion is architecture I had my chance to build our dream house. Huatulco, with its own airport, 9 bays, 'green living' motto and master plan that doesn't include any high rise complexes, feels like heaven. There is no traffic as you drive down some of the most beautiful tree lined streets in the world. There is every water sport from deep sea fishing, snorkeling, diving, water skiing, swimming, surfing, parasailing and of course sunbathing with the perfect drink in your hand. For the land lover there is golf, horseback riding, water falls to explore, ATV tours and beautiful hikes. This could be heaven on earth. We enjoyed our stay at Villa Vidu so much that we can&#x2019;t wait to go back! The villa was exceptional and the beach /sunrise and set were to die for. The in hose help made our stay very comfortable and welcoming. Dear Tracey, Thank you so much for taking the time to share your experience at Villa Vidu. We’re so pleased that you are leaving with great memories and we look forward to welcoming you back again one day soon! Sincerely, your Friends at My Huatulco Vacation. We had a nice time the property is spectacular full of details. Nice Architect made this home!! The view is beautiful from the master bedroom, the other 2 don't have sea view. Rooms are good size and everything is well and clean. The master is unique with the open bathroom. We had a nice weather so it was perfect. One problem was the internet I did not asked before, but it was a problem since my husband was closing an important deal. Any way Cathy did everything that she could to have connection: she send a technician to make it work but the problem is that the signal is very poor because of the mountains. She offered to do anything that we need in her office. In some how it was nice because the children (19, 21, 24 and 27) couldn't be on the cel, ipad, computer or whatever. An other thing is that the master needs a little bit more of intimacy since the entrance is a huge window with clear shades so you feel every one that passes can see thru (from the inside of the hall way), and that door is so heavy I needed my husband to move it every time i needed to go in or out. But well it is not an issue once you enjoy that wonderful view. The kitchen in fulfilled of everything you could think, it is very nice equipped!! Judith the service lady is very nice and helpful, she has a very nice attitude. I can a sure you would have a wonderful vacation here. Just one more thing there is a construction going on, behind the house, they where just starting with the bulldozer and was a little noisy. Dear Monica, Thank you so much for taking the time to share your experience at Villa Vidu. I am glad you enjoyed your stay, and in spite of the internet service you could make the most of it and finally be able to enjoy your children more than the usual I am sorry you missed the blinds which are always rolled up on the side of the hallway actually to provide intimicy to the master bedroom. I know that your cooked a lot during your stay so is helpful for us to know that the kitchen is well-equiped and reached your expectations. Regards, Cathy Bergamo & Your Friends at My Huatulco Vacation. Dear Katey, Thank you for sharing your experience at Villa Vidu, it seems you make the most of the Villa & the area of Bocana community. I am glad you truly enjoyed your stay at the villa, and more knowing that it was your first time out of an all-inclusive hotel. Judith & Camerino being always around, is easy to request any assistance for taking a taxi, or getting food delivery from the restaurant cross the street, hope you also tried the shrimps burger, just delicious ! Hope seeing you in the future to spend other great vacation here in Huatulco, Regards, Cathy Bergamo & Your Friends at My Huatulco Vacation. Villa Vidu - Awesome Experience! Incredible house, pool, beach in small village setting! Great mgmt company and house staff to support all needs! We are 3 Canadian couples just back from 10 days at Villa Vidu. We are so missing the sunrises and the ocean sounds. Each time we left the Villa for an excursion we felt blest to be coming back to our ocean oasis. The open floor plan takes full advantage of the unique beachfront location. The master bedroom is so amazing we rotated 3 times so each couple could experience the sunrise from it. We enjoyed getting to know the friendly staff. They did everything to make our stay memorable. We'll be back! Our family of eight, aged 13 to 76, had an amazing, restful time at Villa Vidu. It's a visually stunning home in an exceptionally beautiful location. It was a wonderful place to take a pause, to listen to the surf, play on the beach, swim in the ocean and the pool, read in the shade and to watch the sun rise over the ocean. We were very well looked after by MHV before we arrived and by in-house staff at the villa, who were a pleasure and exceptionally accommodating. Thank you very much Andrea for sharing your experience at Villa Vidu. We are very happy to know that you & your family spent a great time at the property and enjoyed the area. It was a pleasure to have you around, hopefully we will have the opportunity to host you again in the future. Sincerely, Cathy & Your Friends at My Huatulco Vacation.